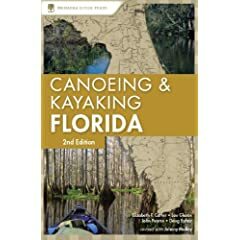 Completely updated, A Canoeing & Kayaking Guide to Florida, 2nd is the most comprehensive guide to the best of Florida’s unique streams, springs, creeks, and rivers. Engaging and concise yet filled with carefully selected details vital to any successful Florida paddling adventure, A Canoeing & Kayaking Guide to Florida spares readers encyclopedic fluff in favor of practical, no-nonsense information. With expanded regional maps and revised river maps, A Canoeing & Kayaking Guide to Florida is simply the best and most informative Florida paddling guide available. Florida has a lot of water. So it is only natural that native Floridians and transplants alike would begin to ply the waterways of the paddle rich state. Of course, Florida’s Indians and subsequent settlers had been using the creeks, streams and rivers as long as they had been in this watery paradise. The rise of kayaking has led paddling’s popularity to skyrocket. Now, folks could, would and do set out in their own boat on every type of kayak, from small sit-on-tops to long and narrow touring sea kayaks. More people explored new waterways, not only in new kayaks made of varied plastic, but also ultra lightweight canoes easy to paddle and transport. When I got an opportunity work on this book, I took my job seriously, floating rivers, checking access points, adding opportunities for Florida paddlers. I added more wilderness oriented rivers to the book, such as Econfina River of Taylor County and the New River, which flows through Tates Hell State Forest. 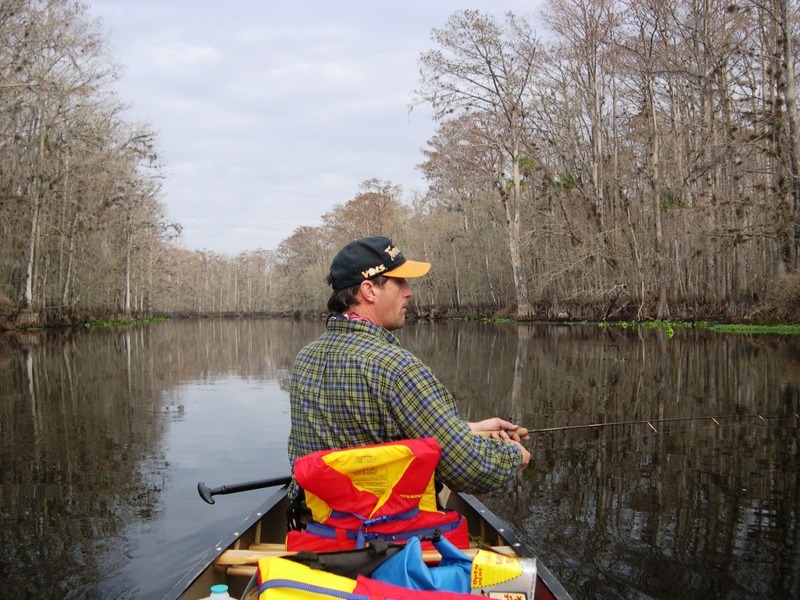 Other new destinations involved developed paddling trails such as Graham Creek and the East River, part of the Apalachicola Wildlife and Environmental Area, a preserved estuarine swath of the lower Apalachicola River in the Panhandle. Along the way I got lost in the Jeep, lost in the boat, rained on, sunburned, scraped ice off the canoe in the morning, jumped in the water after a blazing afternoon in the kayak, got bit by no-see-ums near the coast and away from the coast, got bit by troublesome mosquitoes nearly everywhere, cut my foot on oyster bars, got stopped by headwinds in the Everglades, fell onto a cypress stump, crashed into logs, got stuck in shallows, knocked a fishing pole into the water, and couldn’t find a campsite when I needed one. But I also saw azaleas bloom on the Sopchoppy, shot the shoals on Sweetwater Creek, turned a lazy bend on the New River and saw a bear, saw more springs than you can imagine on the Suwannee and other rivers, met other paddlers all over the place, making new friends along the way. I also got to see smiles on the faces of those peering into the clear waters of the Weeki Wachee River, enjoyed a great campfire and a better dinner on the Peace, and saw why the Loxahatchee is a federally designated wild and scenic river. Overall it was a great experience and I am humbled to be a part of this book that will, in its updated and improved state, continue to serve the paddlers of Florida. This book informs paddlers of river, creek and stream paddling opportunities in the Sunshine State, especially as the sport has advanced and many new waterways are being explored. Many new watercourses have been added to this latest edition, which combines volume I and volume II of the old books. This guidebook is the product of paddling and scouting miles of river, more miles of driving, shuttling, loading and unloading boats ad infinitum and hours of map work, information gathering and research writing. Along the way, many memories were made. I hope you will make some memories of your own, paddling the streams of Florida. The Econfina River of Taylor County, in the Big Bend, is not to be confused with Econfina Creek of Washington and Bay counties. This Econfina is lesser known as a paddling destination, and is certainly underused as such. Born in the Swamps of Pedro Bay east of Perry, the Econfina gathers water and becomes a stream in the far east of Taylor County. Fallen trees, submerged logs and generally keep it impassable to all but the most strenuous paddlers until the US 98 bridge. Here a boat ramp allows easy access the beginning of a beautiful trip through junglesque terrain of a swamp river. Part of the river is bordered by Suwannee River Water Management District Lands and downstream more river shore is state park land, keeping the atmosphere remote. This canopied black water stream flows swiftly for the Gulf at US 98. It is 20-30 feet wide here. Palms and oaks hang over the stream while cypress grow tall and stately along the river and in the swamps behind the banks. Palmetto covers the floor of the high ground beneath the trees. Lily pads thrive in still waters. Expect to pull over or around downed trees along the way. The banks are often low and water drifts off into cypress sloughs. The main channel is easily discernable, though, and sometimes small wooded islands force the stream to work around them. Pass under a power line at one mile. Just downstream, look for an elevated logging tram crossing the swamp and the pilings of an old bridge on the river’s edge. After many twists and turns, enter an area known as the Mill Pond. Here, the current slackens and waterweeds grow along the edge of a much wider stream. These waterweeds form the river channel. High ground here and there allows you to relax out of the boat. Just below the Mill Pond the Econfina narrows and resumes its fast moving ways. Here are the concrete abutments of an old bridge that may be rebuilt. Begin state park property on river right. The swift water continues southwesterly and ends just beyond the Mossy Hammock Road bridge. Here, the Econfina broadens a bit and houses become more common, though public lands extend farther downstream. Tidal influence changes current speed but it is not long before you reach the state park boat ramp on river right. From Perry, take US 98 west to bridge over Econfina River. A boat ramp is on the northeast side of the bridge. To reach the take-out, continue west on US 98 to County Road 14. Turn left on CR 14 to dead end at the Econfina River State Park boat launch. A fee is required for this launch. Web. The USGS gauge is Econfina River near Perry, FL. The minimum recommended runnable level is 140 cfs. First, an overview description of the river is given, followed by detail of maps that can be used for that particular section of river. Topographic maps are listed in the order in which the river flows. Unless otherwise noted as above, all maps are located on the Florida Index of the United States Geological Survey. If there is not a local source for maps they can be ordered on the Web at www.topozone.com. Next, the specific section of the river is spelled out, in this case from US 98 to Econfina River State Park. The shuttle portion lists the exact take-out and put-in with directions to a particular highway or secondary road bridge. Detailed directions have been given to find the put-in and the take-out. Where there are several sections of a particular stream included, only the put-in on the first section and the take-out on the last section are described. The gauge section tells readers exactly which gauges are needed to determine river runnability. Beside this narrative are headings for each river listing the following data: river difficulty, river length, river gauge, water level, river gradient, and scenery. River difficulty classification is adapted from the system used by American Whitewater. Difficulty is rated Class I-VI. For detailed information on the rating system, refer to the Rating River Difficulty section in the Appendix. Length provides the river miles traversed between the put-in and take-out. Time provides conservative paddling times for the runs without allowing for lunch, fishing, playing, napping, etc. Wind, currents and tides can alter these times. Gauge indicates whether the gauge of the river is visual, phone or web. In this case, the Web is used. If visual, you literally have to look at the river to determine whether it is runnable or not. Phone indicates you can call a number to find out if it is runnable and Web means you can look on the Internet to find out whether it can be floated. Level indicates the flow rates at which a particular river can be run. Most Florida rivers can be run year-round. Where we do not have a specific figure we list the level as “NA,” meaning not available. Government agencies like the United States Geological Survey (USGS) measure river flows at gauging stations throughout the country. This information is collected and recorded hourly. You will find pertinent websites and phone numbers listed in the discussion of river gauges below. You will also encounter “paddler’s gauges” painted on bridge piers and rocks. Although not reported on websites and such, they remain in use. Gradient is the average drop of the river in feet per mile. For example, 2 means that the river drops at an average rate of 2 feet per mile. Remember: the difficulty of a river’s rapids is not determined by gradient alone. Some rivers drop evenly over continuous rapids of roughly the same difficulty. Others alternate between long pools and drops that are steeper than the gradient would indicate. Many Florida rivers have swift currents that sweep through fallen trees around unseen bends, adding to difficulty. The accompanying river descriptions will give some insight into the river itself. Scenery is ranked on an A to D scale, A—remote wilderness areas with little sign of civilization, B—more settled, but still beautiful pastoral countryside, C—lots of development (cities or industry), D—pollution, phosphate mines, rundown buildings, and other forms of landscape abuse. The quality of the scenery along a river can change. For example, the Hillsborough River within Hillsborough River State Park is considered A, but becomes C on its lower reaches where houses become common. However, cities and manufactured settings are not necessarily eyesores. Finally, maps accompany each river included in this guidebook. These maps will aid paddlers in finding their way.